Boys’ reading is a topic of perennial concern, and it has always been one of my most frequently requested areas of training. It’s in the news again this week, with the publication of a report by the All-Party Parliamentary Literacy Group Boys’ Reading Commission. The Commission’s findings are important, and their recommendations are pertinent and wide-ranging. Not surprisingly, reading for enjoyment features heavily. The need for male role models is highlighted, along with support for parents and carers. I am pleased that the Commission also recommends that every teacher should have an up-to-date knowledge of reading materials that will appeal to disengaged boys. Michael Morpurgo has written an interesting and useful article reflecting on the report. The discussion thread is instructive too. 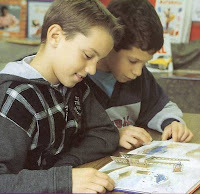 If you have not seen it already, you may like to look at a blog about boy’s reading that I posted in February, bringing together a range of useful links. Since then, I have come across these tips for getting boys to read on the Words for Life site. I am sure that for many boys reading is too solitary and too passive. I love the picture here, courtesy of the National Centre for Language and Literacy, showing it doesn’t have to be either.